Beautifully engraved certificate from the Sportsline.com. This historic document was printed by the Security-Columbian United States Banknote Company and has an ornate border around it with a vignette of the company logo. This item has the printed signatures of the Company’s Chairman of the Board, President and Chief Executive Officer and Chief Financial Officer and Secretary. SportsLine.com, Inc. (NASDAQ:SPLN) is at the leading edge of media companies providing Internet sports content, community and e-commerce on a global basis. As the publisher of CBS SportsLine.com and the official Web sites of the NFL and the PGA TOUR, the Company serves as one of the most comprehensive sports information sources available, containing an unmatched breadth and depth of multimedia sports news, information, entertainment and merchandise. SportsLine.com also has strategic relationships with Major League Baseball and the NBA, and serves as a primary sports content provider for America Online. In 1999, the Company commenced operations in Europe through Sports.com Limited, Europe's leading Internet and mobile data provider of sports content. SportsLine.com has been successful in generating revenue through multiple sources, and excels in leveraging its highly desirable demographic audience of affluent males ages 18-54, to major advertisers who want to reach their target market 24 hours a day, 7 days a week. 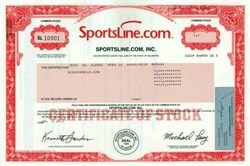 In addition to advertising and sponsorships, SportsLine.com's other primary sources of revenue are subscription services and content licensing. The company's stock price reached $60 in 2000. Please note that if you buy a modern certificate from a discount or full service broker, it can cost you between $55 to $100 and that doesn't even include the cost of the stock. You will be charged for a commission and certificate issuance fee. Furthermore, if the company has been delisted and no longer traded, you will unable to get the certificate. Also, the modern certificates we offer have not been folded in thirds which is usually done if you order them directly from a broker. Lastly, the certificates are not issued in your name so if you frame the certificate and/or subsequently resell it as a collectible, the certificate won't have your personal information printed on its face.